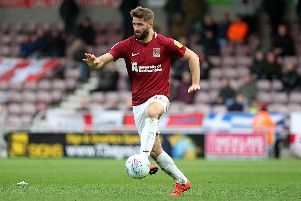 Cobblers defender Ash Taylor believes it can only be a good thing that manager Dean Austin has a full pre-season to get his ideas across to the squad ahead of the new Sky Bet League Two campaign. Austin made an instant impact when he was placed in temporary charge of the team in April following the sacking of Jimmy Floyd Hasselbaink, but he couldn’t halt the team’s slide towards relegation from league one. Austin was rewarded for his efforts by being handed the Town top job on a permanent basis, and has spent the whole summer plotting how he wants the players to go about their business in the coming season. The squad reported back for pre-season in the final week of June, and this week are spending the week in Spain as the build up intensifies ahead of the league two opener against Lincoln City on home soil on August 4. Austin has been putting the players through two training sessions a day, and Taylor says the manager is getting his message across. “When he (Austin) took temporary charge, he got over what he really wanted to do, and we took well to it,” said the former Aberdeen defender. “It was a good end to the season, and what we want to plan for this season, he has enough time to implement what he wants to properly. The clash with the Imps is a little over a fortnight away, and Taylor knows it is important he and his team-mates get off to a good start and hit the ground running, something they failed to do last season, losing their first four league games and also bowing out of the Carabao Cup. “That is what we have to do, as you have to build momentum straight away,” said the 27-year-old. “Momentum is a big part of football, and if you chalk off a win you keep that confidence, and you keep that momentum going and it is going to be a good season. “You want to build good habits up for the season, and it’s a good base here, getting away for the week to get the work in and know what you want to do throughout the season. Taylor says the atmosphere among the players in Spain has been good, and that they are grafting as hard as they can. “We have settled in really well and it has been a good couple of days so far, we have got some good work in,” he said. The Cobblers will train twice a day all this week, apart from Thursday when they will train in the morning and then take on Hull City Under-23s in a friendly at their Real Club de Golf Campoamor complex base, and that’s a game he is looking forward to. “At this stage it is all about getting the minutes in the tank and coming through unscathed and injury free, because there is a lot of work we are putting in,” said the Merseysider.